Normally, I don’t care for beet soup, but then I had leftover beets and I’m really trying to 1.) save and 2.) not let food to go waste. 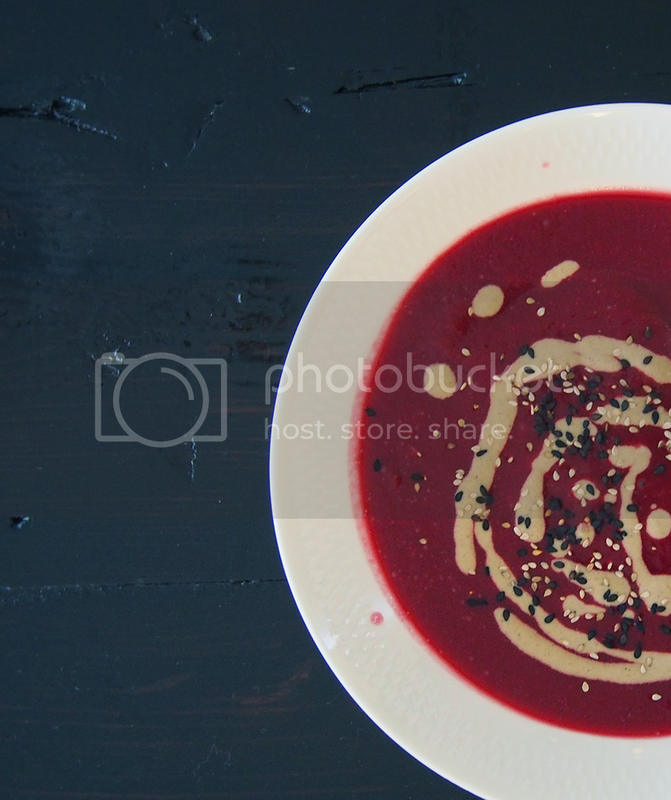 This turned out really good – I think my aversion towards beet soup is now gone. This beet soup can easily be eaten without the goma dressing, but it just adds a whole other kick to it, and the goma dressing is so so easy to make. Find the recipe here. Remove the skin from the beets and celeriac. Peel the onion. Chop everything into 1 inch cubes. Add to a pot and cover with water – just enough so that everything is covered. Boil the veggies until soft enough to blend. Add more water if necessary to make sure the texture is like a velvet soup. Blend the cashews with the water, yeast, ginger and salt. Add more water if needed to this if it’s too much like a paste. It should be creamy. Add the cashew cream into the soup, and stir well. Finally add the cumin, stir and warm the soup – no need to boil. Season with salt and pepper and serve.